The cost of climbing Kilimanjaro is non-trivial. Many people commit to climbing Kilimanjaro before thinking through the full financial implications. In this article we discuss the cost considerations for climbing Kilimanjaro that most people often forget to account for. Feel free to ask any questions in the comments at the end of this article if you are still unsure about costs. We will respond within 24hours. The total climbing Kilimanjaro cost is usually significantly more than the travel package numbers that you see on travel / adventure tour websites. There are a number of costs that are not accounted for in the total travel package cost. In our experience there are 7 key costs that you should budget for, as follows. The cost of getting to Kilimanjaro is usually accounts for a significant portion of your total Kilimanjaro adventure. Depending on where you are flying from you might have a journey that involves two connections. Most climbers fly into Nairobi or Addis Ababa and then catch a connection flight (typically Precision Air – not sure how Precise they are, Ha!) to Kilimanjaro International Airport. Alternatively there is a direct flight from Amsterdam to Kilimanjaro with KLM that flies daily. Check prices here. Most trekkers book their climbing adventure through established tour operators who typically offer all-inclusive packages which includes airport transfers, a night in a hotel before and after the trek and all expenses on the mountain (food, porters, guide, tents etc.). The cost for these tours varies depending on which route you take and the number of days you choose. There are seven routes on Kilimanjaro. Northern Circuit is the more expensive route as it is the longest on Mount Kilimanjaro. Trek lengths range from 5 days (cheapest) to 10 days (most expensive). Five-day treks are too short for the average hiker in terms of acclimatisation (less than 50% of trekkers reach the summit on the 5-day treks). If you are looking to go budget we suggest choosing a six or seven day trek which usually gives you an acclimatisation day, and increases your probability of summit success a lot. If you want to really increase your chances of reaching the summit then an 8-day trek is great. Most trekkers need a Tanzanian visa. You can either organise a visa with your local Tanzanian embassy or purchase a visa on arrival in Kilimanjaro. We suggest getting a visa before you depart as it means you can avoid the queues at Kilimanjaro International Airport. Most trekkers also need a Yellow Fever vaccination card when entering Tanzania. Costs for Yellow Fever vaccinations vary but can be as much as $100. In addition to Yellow Fever you may want to get a HEP-A vaccination and a Polio Tetanus Diphtheria booster. Tanzania is a malaria area as well. The risk of contracting malaria is relatively low on the mountain as mosquitoes are not found at high altitude (over 1,800 meters). You will be spending most of your trip above this altitude but will be at risk before and after your hike. Taking malaria tablets is really up to you. There is a cost associated with the medication that can be quite high. Either way we recommend taking all common-sense precautions to avoid being bitten by mosquitoes – i.e. wear Deet repellent, wear light clothes that cover your arms and legs, stay indoors before dawn and after dusk. It is important that you purchase the right equipment for trekking Kilimanjaro. This includes layered clothing, an extreme weather sleeping bag, walking poles, good quality hiking boots, a headlamp, duffel bag, daypack and insulated water bottles. The costs can vary depending on the quality of equipment you buy and whether you already have lots of equipment in your possession. 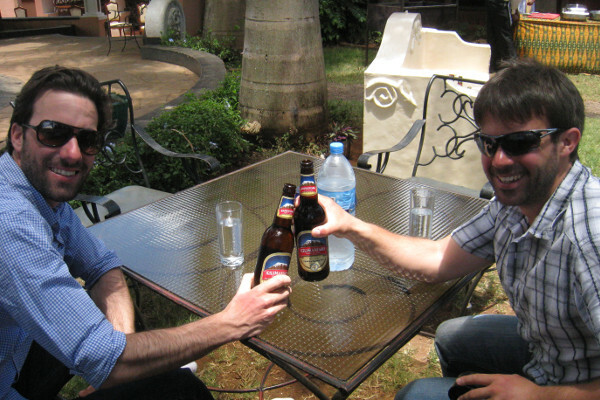 Tipping your support team is standard on Kili. Your guides and porters work extremely hard for very little money. The tips that they receive after the climb go a long way to support their families who they don’t see for weeks on end. If you can afford it we suggest paying more than the standard rate of approx. $300 per climber for your support team. Here is a detailed article on tipping guides and porters on Kilimanjaro. 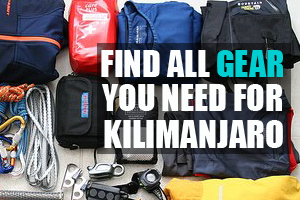 See here for a comprehensive Kilimanjaro gear packing list. Hi, I'm Mark! 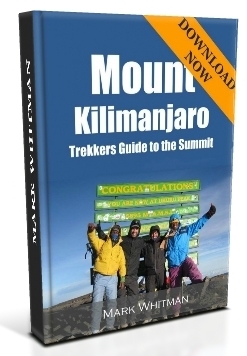 Welcome to Climb Kilimanjaro Guide - the Web's No.1 Trekking Guide to Mount Kilimanjaro. This site is your one stop shop for everything Kilimanjaro. To date over 2 million people have visited ClimbKilimanjaroGuide.com, many of which have gone on to summit Kili! I hope you find all the answers you are looking for, but if you have any questions don't hesitate to drop a comment below! Happy Trekking! I want to do Kili next year October. I want to take my 10 year old son with me. He is a healthy fit boy. I don’t want to set myself or him up for failure. Then I would rather go myself and if not making it, it would only be myself to deal with. Thanks for getting in touch and delighted to hear that you are thinking of trekking Kili with your son. The minimum age for trekking Kili is 10 years old, set by the Tanzania National Parks Authority. I would say it is a serious undertaking for a child of 10, and not to be taken lightly. Success is important but not as important as your safety. As Ed Viesturs, a very famous mountaineer says: ‘Getting to the top is optional, getting down is mandatory’. To maximise your chances of success I would recommend you only consider a 7 or 8 day trek. This will give you both an adequate time to acclimatise to the altitude. It will not guarantee your success but will give you the best chance. I am thinking to do Kilimanjara in june. I´m not a well trained climber. I did climb Toupkal in Morocco last christmas without any problems at all in 1,5 day. Then i guess that is not going to be a problem for me with Kilimanjaro, ( I´m more afraid for the Malaria). I do have a son, 12 years old, and was thinking that i will take him with me. I’m interested in climbing Kilimanjaro in January 2018. I’m a 54 yr. old woman from America. I’m 5ft. 6 inches and approximately 145 pounds. I exercise 4 days a week: I do an hour of spinning/cycling for 2 mornings and an hour of boot camp training (squats, push-ups, planks, etc. weight training using your body as weights along with a medicine ball and 2 10 pound weights) for two mornings. I have yearly physicals and will get one for this climb. Is this good preparation/training for climbing Kilimanjaro? 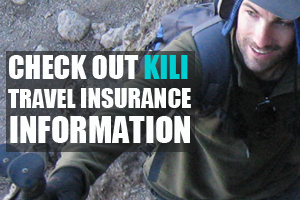 Hi, I have planning to trekking kili , I’m from Indonesia, I don’t need any visa Tanzania right ? Hi Fadilla, yes, you do need a Visa. I always travel alone and I am planning my trips the same way. Is it mandatory to buy a package and a guide If I am well experienced in trekking and climbing? I also have proper gear, gps, etc. Hi Matt, it is possible to do a ‘lite’ support trek, but to get onto the mountain you need to employ the services of a registered guide and pay the park fees (~$800-$900). All routes, except the Marangu, are camping expeditions so you will likely need a porter or two to assist with carrying gear / food etc. The benefit of a package tour with a responsible company is that you get a full support team (guides, porters, chef etc), great food and equipment and peace of mind that your staff are being paid properly and your money is safe if they are bonded and insured. Package tours usually include hotels pre and post the trek and transfers. Hope this helps. This is Hmanshu from India. I want to trek mount kili in June this year. I have never climbed just peaks. So I want to opt for a 7 or 8 days trek. Just wanted to know what is the total fee including hotel and support team for the 7 days trek. Hi Himanshu, Costs vary by operator and whether you join a group or go private. Assuming you join a group, on the budget end you can expect to pay about US$1800 for a 7-day trek. 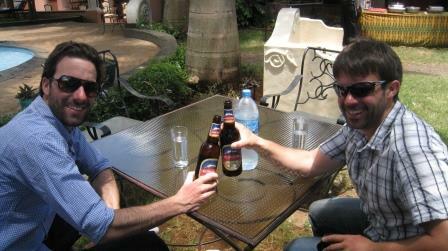 Operators with great reputations / reviews and track records will be closer to US$2500 for a 7 day trek (incl. 2 x nights in a hotel pre and post the trek and airport transfers). The luxury or specialised mountaineering end of the market might be closer to US$3000. We can put you in touch with our recommended operator – just click here and complete the form. what would happen if someone wanted to climb the mountain without paying for guides and porters etc… ? Hi Paul, it is not possible to climb Kilimanjaro without a registered guide. There are some tour operators who offer lite versions with just a guide a few porters, but you would need to be a very fit and an experienced hiker to do this. This is Sunil from India, which is good season for trekking to kilimanjaro. Hi I am a student nurse from the UK and going over to Tanzania for five weeks. Three weeks of this will be spent volunteering and the last two weeks, climbing Kilimamjaro and getting home. I was wondering if my lack of physical activity in those first three weeks would jeopardise my climb up Kili? Hi Melissa, I definitely think volunteering will be beneficial for you personal and for those you are helping, and will likely have neglible impact on your Kilimanjaro climb. From an acclimatisation perspective there certainly isn’t any benefit of spending time on the lower reaches and flatlands below Kilimanjaro. You might want to take a few days over one of the weekends and climb Mt. Meru, which would be super beneficial for your Kilimanjaro ascent!. Hope this helps! My brother and I are coming to climb Kilimanjaro in October and would like to add on a safari, prices seem high at 500 dollars per person per day, is this about right? Hi Stephen, yeah, that seems about right. Park fees in Tanzania have gone up recently with VAT now an additional cost. You can get cheaper safaris but these tend to be large groups or super budget. Do you know if tours provide discounts for groups of 3 or more? I want to do this with my wife and son. A few of our friends may be interested in joining us. Hi Stephen, yes, most tour operators will offer group discounts as your party expands. Many tour operators also run open groups where you can benefit from the scale of the group for better pricing. All the best!